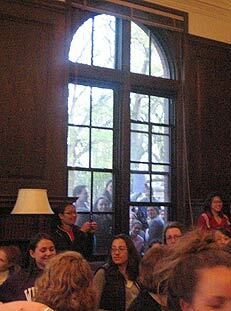 Lesbian activists at Smith College riot, shut down Ryan Sorba speech on “The Born Gay Hoax” as police watch. See exclusive videos. There were no arrests and no charges of disorderly conduct. This would seem to be a clear violation of the Massachusetts’ Civil Rights statutes. VIDEO I: Starts about 15 minutes into the event. As Ryan Sorba is giving speech activists climb in through windows, begin screaming, then storm the podium. 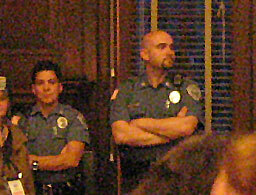 Police watch as riot ensues, speaker is forced out of room. Afterwards activists continue to occupy room, scream chants, etc. VIDEO II: Stationary camera on speaker shows melee as activists storm podium, take over entire front area of room, and comandeer microphone when officials force speaker to leave. Starts about 17 minutes into the event. 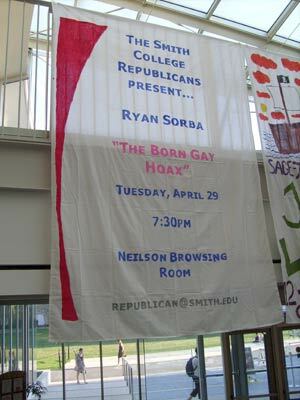 Sorba had been invited to speak by the Smith Republican Club and the speech had been widely publicized. He has given the speech at colleges around the country, most recently at Framingham State College. The Smith Republicans had asked the police to be present in case any disruption took place during the event. The disruption appeared to be planned in advance. The intent was clearly to stop the speech from taking place and to terrorize and intimidate the participants. 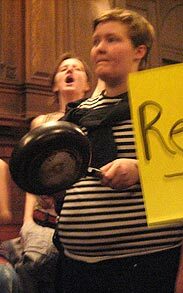 Shortly after Sorba began speaking, members of the audience started chanting slogans and beating on pots and pans. Then about 15 minutes into the speech, people began to climb into the room through the windows, and a group stormed the podium and stood in front of it screaming and jumping up and down. Then dozens of people began running throughout the room began and screaming “We’re here, we’re queer, get used to it” and later “Hell no, we won’t go.” It quickly became impossible for the speech to continue. There were at least two uniformed police officers, a security guard, and one university official in the room. They made no serious effort to stop the rioters. They mostly just stood and watched. Members of the Smith Republican Club tried to stop people from taking over the podium area, but they were easily overwhelmed by the rioters. After a few minutes police and university officials ordered Ryan Sorba to leave “for his own safety.” After that, the rioters used the microphone to exhort the crowd. At first Sorba was told that he could return after about 20 minutes. But after Sorba left, the rioters continued to occupy in the room. They said they were staying in case he came back to make sure he would not be able to deliver his speech. Later the event was completely cancelled for the evening. 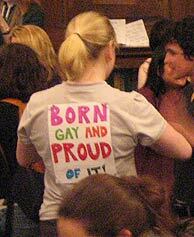 After Sorba left the room, the rioters talked about this action being “queer activism”. And so it is. This is exactly how the homosexual movement views free speech and civil rights in their march to and force their social and sexual agenda on others and intimidate and terrorize anyone who would criticize or disagree. Truth and freedom become subjected to the whims of thought police and rioters. 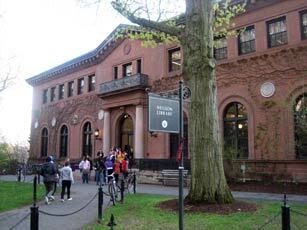 Outside the Neilson Library hours before the event. When people came inside and sat down to hear the speech things didn't seem too ominous. But as Ryan Sorba began to speak, the noise started, including beating of pots and pans! And the signs came out . . .
After ten minutes or so they started to climb in the windows and scream in the back. 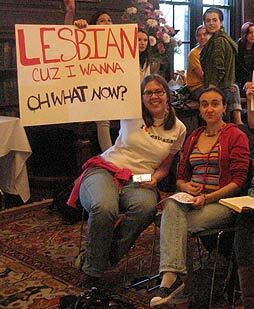 As Ryan continues to attempt to give his speech, lesbian activists stand in front of him and scream. As all this was going on, the uniformed police just stood there and watched. Afterwards it got even weirder. At right, a young man in a cocktail dress stands up in the back and adresses the activists. You've got to see this on the video (Part I, near the end). I write in response to the events of last evening, in which an invited speech by author Ryan Sorba was disrupted by loud protests and ultimately did not go forward. The event was planned and funded by the Smith Republicans, which, like every student organization, has the right to invite speakers of its choice. The decision to halt his presentation was made jointly by public safety, student affairs and the Republican club leadership. There were serious concerns about overcrowding, audience and speaker safety, and facility damage. On a pragmatic level, after about 10 minutes the speaker could not be heard. Whether or not one agrees with a speaker, academic freedom is a core value of colleges and universities, one in which I believe strongly. Such freedom entails the right for duly constituted campus organizations to invite speakers to campus who have controversial views, with which people may disagree or even find reprehensible. While I understand the strong feelings Mr. Sorba's writings elicit, I am disappointed that some members of our community chose not to uphold our own commitment to freedom of expression. 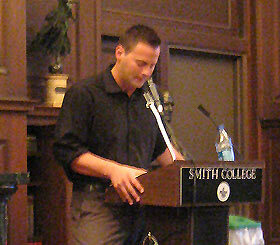 As clearly affirmed in Smith's statement of academic freedom and freedom of expression, "Once members of the Smith community extend an invitation, others may not abridge a speaker's freedom of expression because they dislike or oppose the speaker, find her or his ideas noxious, or perceive the speaker to be associated with policies or practices believed to be erroneous or even evil." We are investigating possible violations of college policy, including the policy on the conduct of demonstrations and protests. When faced with the visit of a controversial speaker, our challenge as a community is to reaffirm our commitment to teaching and learning. Hearing the views of someone with whom you disagree affords the opportunity to sharpen one's own counterarguments, displaying the weaknesses in their reasoning or evidence. Alternatively, we can boycott speakers whose views we find offensive. At 8 p.m. tonight, at the Academy of Music, Smith is offering a free public screening of Freeheld, the Oscar-winning documentary by Cynthia Wade '89 that chronicles a lesbian couple's struggle for legal and property rights. It stands in contrast to Mr. Sorba's views of a "born-gay hoax" – and both perspectives, whether one finds them compelling or offensive, fall within Smith's commitment to free expression of ideas and values. 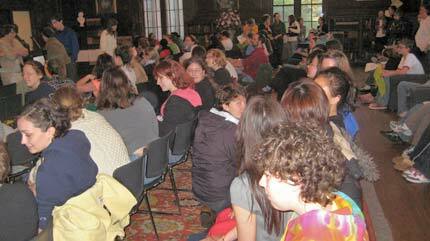 Riot at Smith College, April 29, 2008. 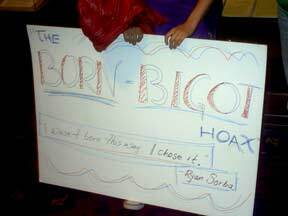 Ryan Sorba’s lecture, “The Born Gay Hoax,” disrupted by radical queers. 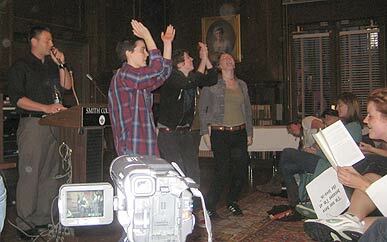 Anarchy and homofascism take over the library at Smith College. Where is the institutional support for free speech and order on the Smith campus? The college officials present did not take control of the situation. Mr. Sorba’s constitutional rights were clearly violated. 1 min 20 sec: Security guard gives up on weak attempt to eject disrupter. 3:20 Disrupter ignores student Republican Club head’s attempt to enforce order at podium. 5:10-5:50 Smith College authority (middle-aged woman) approaches podium – tells Mr. Sorba he has to leave & policeman enforces her authority. Queer activists scream in joy. 6:30 Sorba announces he’ll be back in 20 minutes to continue speech for those who want to listen. 6:50 “We’re here, we’re queer – Get used to it” -- loud chanting, screaming. 7:20 Queer leader takes over microphone. Adults have totally lost control of the room at this point. 7:38 Policeman walks by podium; does nothing to halt disorder. 8:40 Policewoman removes mic from podium. 8:42 Admin woman walks toward podium, does nothing. 9:00 “Hell no, we won’t go!” screaming. 10:00 “Fairy queen” queer leader makes her appearance. 10:45 Admin woman walks away; out of room? After Mr. Sorba is told to leave the room, note the security guard (red T-shirt) and two police -- standing in corner doing nothing to quell disturbance or eject mob from room. Near end of video, student, apparently a boy in a dress, rallies the crowd. Then, another student, a lone voice of reason, asks the only real question: “You guys are all cheering and that’s great. I understand you’re excited. You won. But what did you really win?” The mob then silences her, as she attempts to elaborate. 1 min 10 sec: 1st swarming of the podium. Note that the security personnel present do nothing. 1:20 Student Republican Club head approaches disrupter at podium, attempts to get her to leave without success. 1:50 Message given to Mr. Sorba from student club head. 3:10 Security guard tells Sorba he needs to stop speaking. 4:05 Policeman walks up to podium to enforce those orders. Sorba leaves room. 5:18 Queer leader takes microphone to rally the mob. 5:40 Policewoman appears to say, “Get out of the room now, OK?” No one obeys. 6:06 Policewoman appears to motion the students out of the room. No one obeys. 6:50 Policeman, security guard, and admin woman still in corner of the room, doing nothing. Throughout the week, a banner had advertised the speech.